In this blog under tableau tip we are going to discuss about applying conditional formatting to individual measures . Remember how in the last article we applied conditional formatting to a single measure across multiple dimension. This time we will do it on individual measures. We will be using our same super store data for this as well. Let say we wan’t to apply conditional formatting to our discount and profit ratio measure across sub categories. Profit ratio more than 25 % are formatted green and those less than 25% are formatted red. 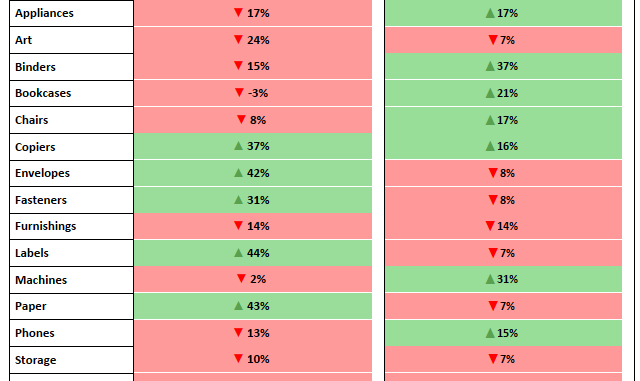 On the other hand in the same report , Average Discount more than 15% is formatted green and red else-wise. Click on the Profit Dummy Axis on the columns and on the color marks place the calculated field Profit ratio Color. Similarly click on the Discount Dummy Axis on the columns and on the color mark for this place the calculated field Discount Color. Here we go . Lets go a step further and add values to the cell along with a up symbol for true and a down symbol for false . We would also like to have the up/down arrow to be colored as green/red respectively. To do this we need to create different fields that would assign these arrows according to our condition. I will do it for Profit and leave the discount one to you guys to do. The up/down arrow symbol can be generated by pressing the ALT 31 together for down and ALT 30 for up arrow. Click on the Profit dummy axis measure on the Columns and place Profit Ratio, Profit Ratio Down Symbol and Profit Ratio Up Symbol to the labels mark. I have left adding KPI to the Discount measure for you guys to try out. Do let me know in case if you are not able to get it. Hi Manoj, thanks a lot for your suggestion. I will definitely look into this and try to post it. Thanks again for your time! !